SD40-2's left are 5560 5593 5615 5651. GP9u's are 8212 8223 8225 8245 (at most) and 2or 3 1500/1600's. Two GP38-2's on the D&H also remain, 7306 7308. Compiled by William D. Miller with substantial help from Greg McDonnell. This is a complete summary of units that were lettered STLH. While STLH had assigned power, transfers between STLH and CPR "proper" had these units changing frequently. For more detailed information on the complete CPR/STLH locomotive fleet, see my Canadian Pacific Railway Roster. 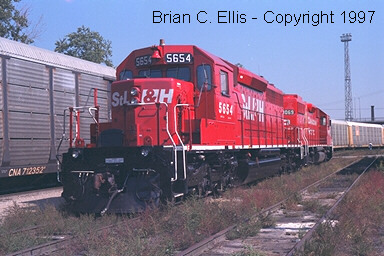 On April 3, 1998, STLH assigned SD40-2 #5617 was outshopped in the new CP "Beaver" paint scheme, thus ending the era of STLH repainting. However, in July, 1998, Slug #1001 was relettered STLH. This page last updated with unit status 2006-02-09 at which time the only STLH SD40-2's remaining were 5560, 5593, 5615, 5651 and 5690. All other STLH units survive except GP9u 1594. 1001  Relettered at Toronto 1998-07.., system red, previously had no lettering; active assigned Toronto. 1594  Relettered at Toronto 1998-01-23, patched CP "action red/multimark" scheme; repaint/re# CP 1594 2005-01; assigned to Winnipeg. 5447  Relettered STLH at Toronto 1998-02-16; sold in 1999; rebuilt to FURX 3012. 5449  Relettered STLH at Toronto 1998-01-23; sold in 1999; rebuilt to FURX 3021. 5532  Relettered STLH from CPRS: SL 1996-12-13 (CPRS 1995-04-28); sold in 2000. 5542  Overhaul & full repaint Ogden 1997-03-24; stored 2004-04-26; shipped to NRE- Livingston, MT 2006-04. 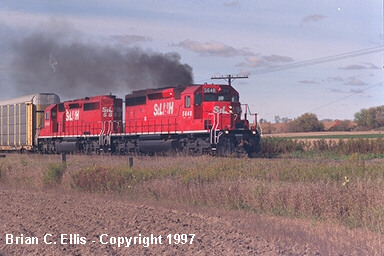 5614  Relettered STLH from CPRS: SL 1997-01-17 (CPRS 1995-09-11); retired. 5619  Overhaul & full repaint Ogden 1997-03-26; retired 2005-08-25 stored at Alyth. 5648  Overhaul & full repaint Ogden 1997-09-10; acquired hood from retired 5637 (m/2003) which had the Canadian Pacific "Beaver" scheme, but initially retained STLH nose lettering since changed to non-standard "CP" font on nose; active assigned Toronto. 5654 *Relettered STLH from CPRS: SL 1996-06-27 (CPRS 1995-06-19) -first one re-lettered; retired 2005-08-04.